Creating an ideal chocolate cake is a tall order. 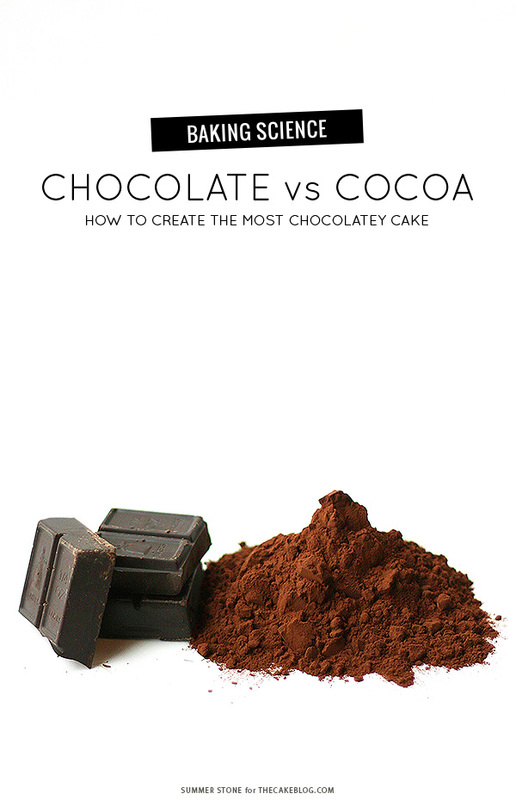 You must balance the texture and structure of a cake while maintaining a distinct chocolatey profile. For some time, I have been in search of a cake that boasts undeniable chocolate flavor, the kind of cake where you can close your eyes and tell, beyond a shadow of a doubt, that it is chocolate cake you are eating. One of the important issues to consider in chocolate recipe formulations is the whether to use chocolate in the cake, cocoa powder or a combination of the two. Here I will take a look at each of these ingredients or ingredient combinations when baked in a cake and discuss which comes across with the best flavor and texture profile. Chocolate and cocoa powder come from cacao beans which have been fermented, extracted and dried. The beans are typically around 50 percent cocoa butter. Cocoa butter is extracted from cocoa beans in the process which creates cocoa powder while additional cocoa butter is required when manufacturing chocolate to give it the appropriate taste, texture and mouthfeel. Some cocoa powders have virtually all of the cocoa butter removed resulting in a powder consisting primarily of finely ground cocoa solids. Other manufacturers allow a portion of the cocoa butter to remain yielding a more rich, fattier cocoa; some cocoas retain as much as 25 percent fat. Cocoa powders generally come in two forms, natural or Dutch processed. Dutch processed cocoa has been treated with alkalizing agents which neutralize the cocoa’s acidity altering its flavor and darkening its color. Natural cocoa is not chemically treated with alkalizing agents and has a lighter color and acidic pH. 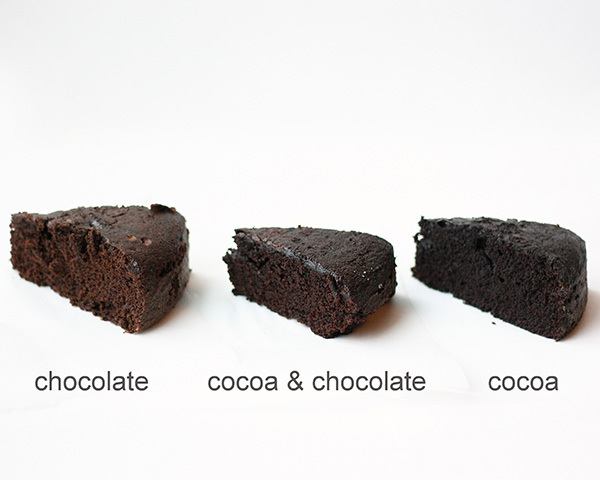 To determine whether chocolate, cocoa or a combination creates the best flavor profile in a cake, I baked three separate cakes one containing only unsweetened chocolate, one with only cocoa powder and one with half unsweetened chocolate and half cocoa powder. I chose to use Dutch processed cocoa powder in this trial because previous comparisons I had made revealed that Dutch cocoa gave a bolder chocolate flavor. The cocoa that I used had minimal cocoa butter removed and contained 24 percent fat. I made adjustments for the differences in fat between the unsweetened chocolate and the cocoa powder. The cake that contained only unsweetened chocolate had a mild, but well-rounded chocolate flavor and was slightly lighter in color than the other two cakes. This flavor of this cake was not bad in any way but it did not have the chocolate impact that I was looking for. 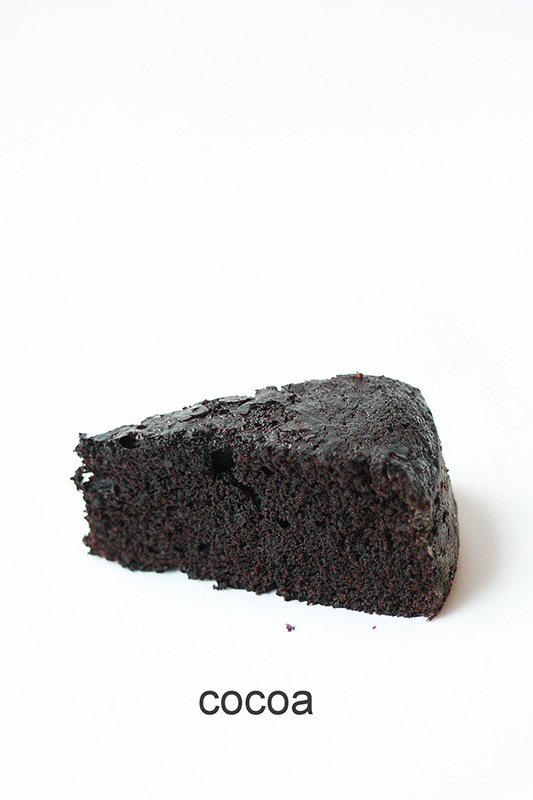 The cake in which I used only cocoa powder had a deep dark color and a bold chocolate flavor. The cocoa seemed to give the cake a more concentrated boost of chocolate intensity but it was missing something that the cakes with unsweetened chocolate possessed. The half unsweetened chocolate half cocoa powder cake had a dark chocolate color, rich flavor and a nuance of cocoa butter that characterized the chocolate-containing cakes. I felt this flavor combination was the best representation of what a chocolate cake should taste like. In this experiment, the best cake was the one that sported substantial amounts of both unsweetened chocolate and cocoa powder. The unsweetened chocolate provided cocoa solids as well as cocoa butter to round out the flavor. The cocoa powder imparted chocolate intensity and deep, dark color. I believe the two chocolate forms marry in cake to bring out the best of what chocolate cake can be. I hope this information helps your chocolate cake-baking efforts! Do Your Cupcakes Need a Rest? 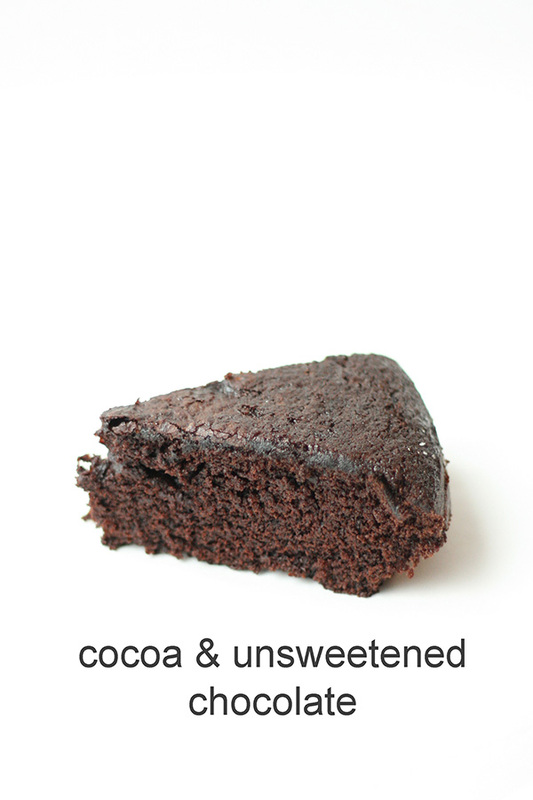 Can you give us a little more information for substituting cocoa for unsweetened chocolate or vice versa? What I’m trying to figure out is, how much fat should I remove or replace if I’m substituting one for the other. Or should I leave the fat measured as the recipe states? Hi! Interesting reading, but can you please give us the recipe you used? Great info and thank you for sharing. I was wondering if you can provide us with the recipe for the cocoa and chocolate cake. Thanks! This is a great comparison on a topic that I’ve wondered about. What I’d love to know now is how do I change a recipe (I’m thinking about a brownie that uses all unsweetened chocolate) to include some cocoa for more chocolate oomph? Is it a 1:1 switch by weight? 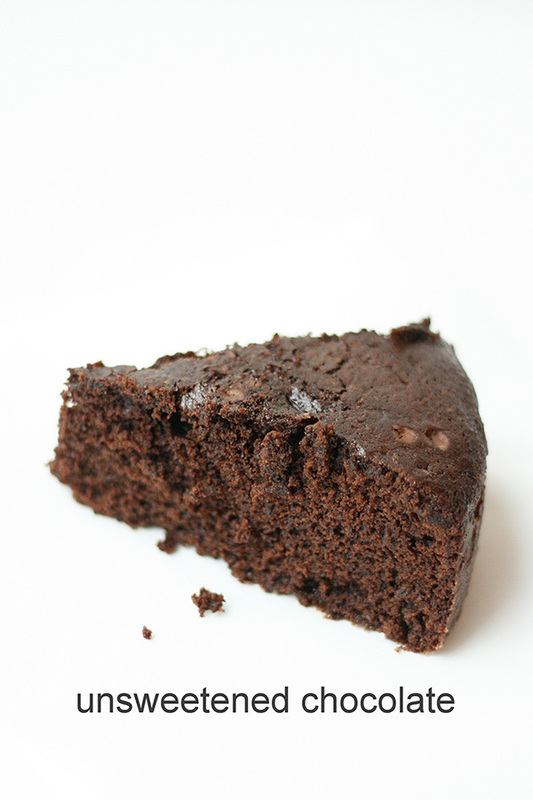 This brownie has a wonderful texture but needs more chocolate – don’t we all need more chocolate?! Thank you. Mixing the 2 different chocolates 1/2 and 1/2, will this affect cooking times or temps? Thank you for this. Would love the recipe for the chocolate & cocoa cake please. Thanks for the comparisons. I just made a batch of 40 chocolate mini bundt cakes and the recipe I used called for cocoa powder, but a cup and a half of brewed coffee was added to the chocolate batter mixture. These little cakes are marvelously chocolaty and really moist and light. Ina Garten always insists that chocolate needs the coffee to boost the flavor, but I had never tried it until today. She’s right. No coffee flavor in my cakes at all, but truly a good, bold chocolate flavor. Okay, this is great information. Now, how do I make the substitutions with the cake recipes that I have? What would the formula be? Thank you.